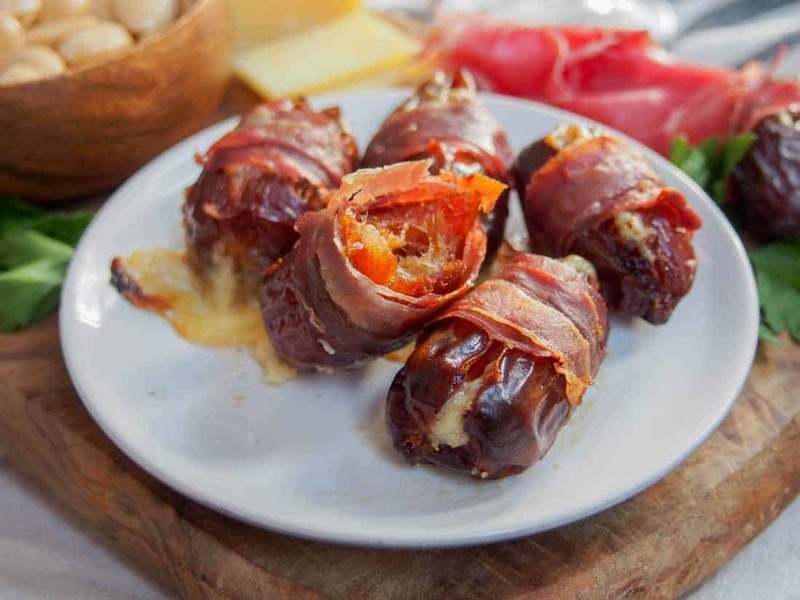 These prosciutto wrapped dates have only 3 ingredients, take no time to prepare and are incredibly moreish. A delicious sweet-salty mix, they’re perfect for parties and snack attacks. Hi there, this is Caroline from Caroline’s Cooking. 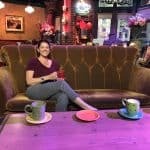 I’m excited to be guest posting on Take Two Tapas, which I’ve been a fan of almost as long as I’ve been blogging. It was the name that first caught my eye – you see I spent some time living in Spain a few years ago and I LOVE tapas. I’ve shared a few of my favorites on my site, like simple summer Spanish tapas, a Spanish cheese plate and white wine marinated steak with blue cheese. And of course drinks to go alongside, as I know Jennifer would appreciate, like cava sangria. I know Take Two Tapas is all about tapas in the broadest sense, and I think these tasty little bites should fit right in. 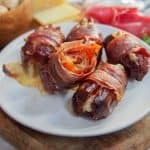 They might not be the prettiest, but these prosciutto wrapped dates are ridiculously simple to make and taste amazing. I first had bacon wrapped dates a few years ago at someone’s house and was immediately in love. I mean, take two of my favorite things and put them together, they’re either going to be a horrible disappointment or turn out amazing. Thankfully, it was the latter. This version with prosciutto and cheese inside makes them that teeny bit fancier, but with that same characteristic sweet-salty mix. 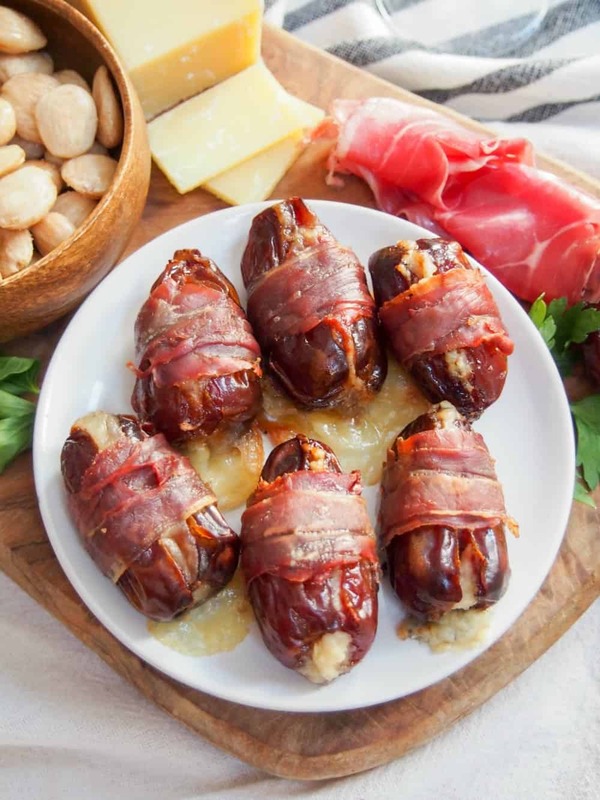 All you need to do is slice the dates lengthwise to take out the stone, fill the middle with cheese then wrap it with a length of prosciutto. Put on a lined baking sheet and bake for around 15 minutes until the prosciutto is crisp and the cheese oozing. Yes, some might escape, but if you leave them to cool a minute you’ll find the cheese is still attached and so you can press it back in a bit or just nibble it as you eat the rest. I filled some with goat’s cheese, and others with gorgonzola. I’d say gorgonzola probably works better and oozes less, but will be a little saltier so choose whichever you prefer. You can skip the cheese altogether, but I do think it’s worth adding if you’re remotely a cheese fan. 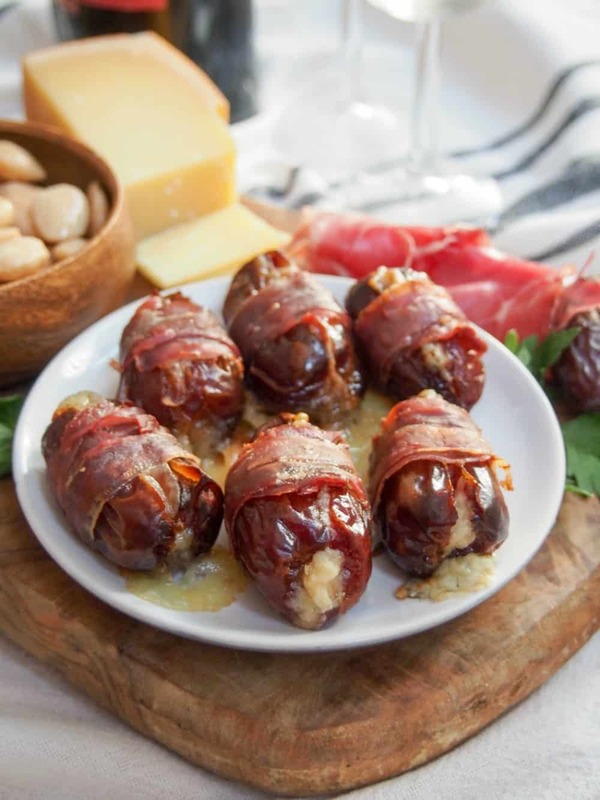 Whatever way you make these, you need to give these prosciutto wrapped dates a try. They’re so easy to make and will disappear from your appetizer table in no time at a party. Plus they’re pretty great if you’re just feeling like a snack. Not that I have any experience of that one, of course. Enjoy! Some other finger foods or Tapas to try are Jennifer’s Bacon Manchego Croquettes or Redneck Sliders with Cornbread. Slice the dates on one side to open them up, remove the stones and any hard stem end. Slice each slice of the prosciutto into 2 or 3 long strips. 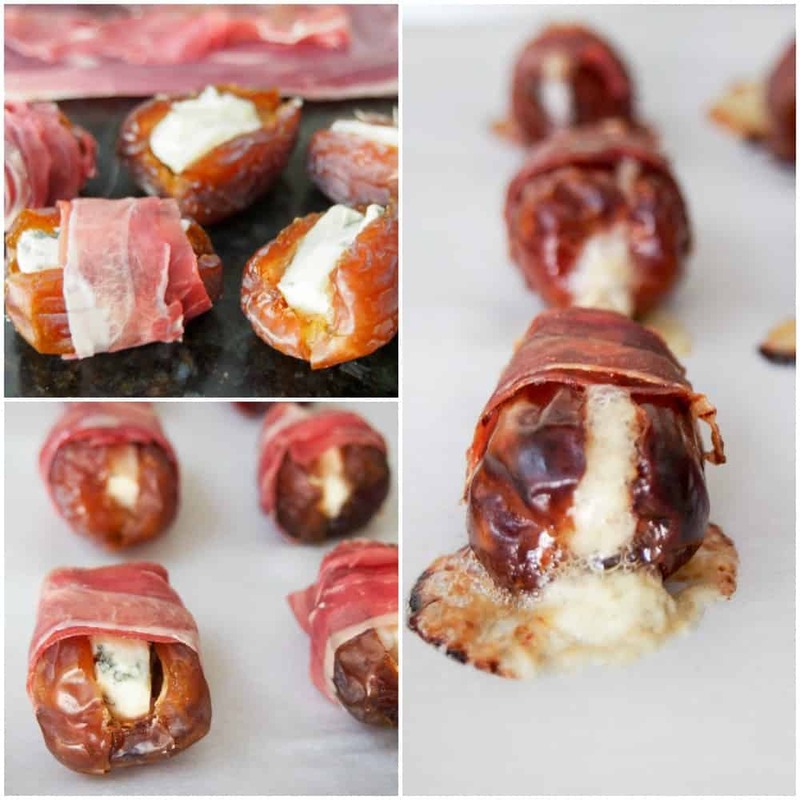 Fill the cavity of each date with around 1tsp cheese then wrap around them with a strip of prosciutto. Pace the dates on a lined baking sheet and bake for approx. 15 minutes until the prosciutto is starting to crisp slightly. Leave to cool a minute before serving (don’t forget to press back in or leave attached any cheese that oozed out, you don’t want to lose it!). Note – increase or decrease the number of dates etc depending on how many you need. What a great way to serve dates. I like that you give 2 different cheeses to stuff with. I’m going to try both.